Have you ever been to a Starbucks, ordered a drink, then realized when you picked it up that it's not what you wanted at all? Well then you're in the right place. I'll give you some tips and information that will turn you into a pro the next time you order at your local Starbucks! What in the world do all these markings mean??!! Did you know that when you walk into any Starbucks, you have the option of choosing from over 87,000 drink combinations? That number can be a little overwhelming! In order to help you figure out exactly what it is you want, I’ve put together some lists of different modifiers and customizations that are available. Let’s start with the sizes. 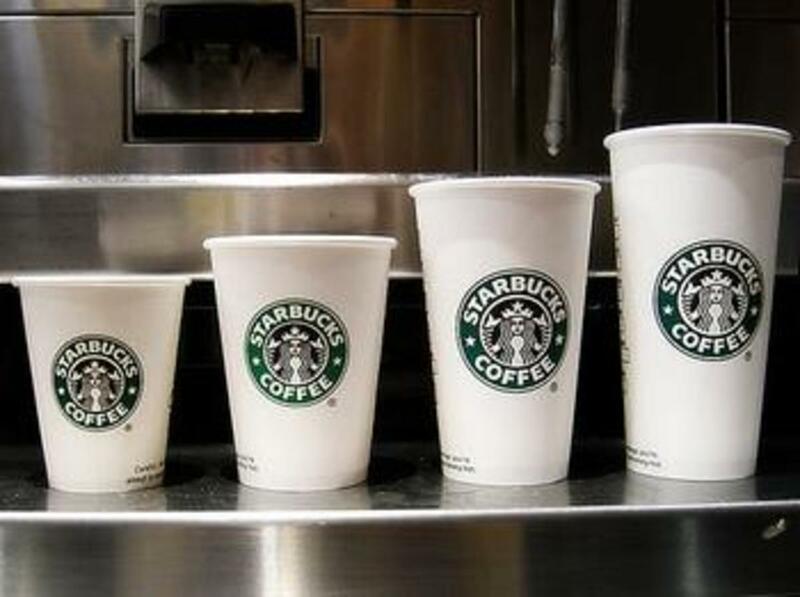 For hot drinks, Starbucks carries four sizes: short[8oz. ], tall[12oz. ], grande[16oz. ], and venti[20oz.]. Most of the time you won’t find the short size on the menu, but rest assured, your barista will be happy to make you any hot drink in the short size. Cold drink sizes are very similar. There are also four cold cup sizes, but they differ slightly from the hot cups. The sizes are: tall[12oz. ], grande[16oz. ], venti[24oz. ], and a newly released size, the trenta[30oz.]. Any cold drink can be ordered in the first three sizes, but the fourth size, the trenta, is reserved for iced teas and iced coffees. Some people are really intimidated by the “fancy Starbucks language” when it come to the size, so it’s completely ok to order a small, medium, or large. Your barista may repeat it back as tall, grande or venti, but that’s not to put you down, it’s just out of habit. And ordering it as a large gets rid of the confusion when people order a tall and think they’re getting a large! From left to right: short, tall, grande, venti. "I wanted an extra shot in there, did you get that?" If you've been in a Starbucks, there's a chance you've heard the baristas throwing around "coffee language" that you don't quite understand. "Triple," quad," and half-caf" are just a few examples. All of these refer to the amount or kind of espresso that is going into your drink. All espresso is is a concentrated "shot" of coffee that is made by forcing steam through ground espresso beans. All espresso shots are one ounce shots. There are two types of espresso: regular and decaf. Regular espresso contains approximately 75mg per shot. Many people assume that decaf coffee and decaf espresso contain no caffeine, but that's not the case. That's because "decaffeinated" is completely different than "caffeine-free." If something is decaffeinated, it has gone through several chemical processes in order to remove the caffeine. Coffee has over 400 chemicals that are important to the taste and aroma of the final product, so it's difficult to remove every last drop of caffeine without disrupting the other chemicals. If something is caffeine-free, it is naturally without caffeine. Therefore, one shot of decaf espresso contains approximately 3mg of caffeine, a minute amount compared to the 75mg in a regular shot. It is also possible to get drinks with half regular espresso, half decaf espresso, shortened to "half-caf." "How many shots come in my drink?" You can always ask for less espresso or more espresso. If you were to add one shot to a hot grande drink, it would become a "triple." That's because a hot grande drink normally gets two shots, so you're adding another, making the total three. Hence, a triple. The same logic is applied to "quad" and "single." If you can't remember how many shots come in your favorite drink, but know that you need an extra kick, just request an extra shot. 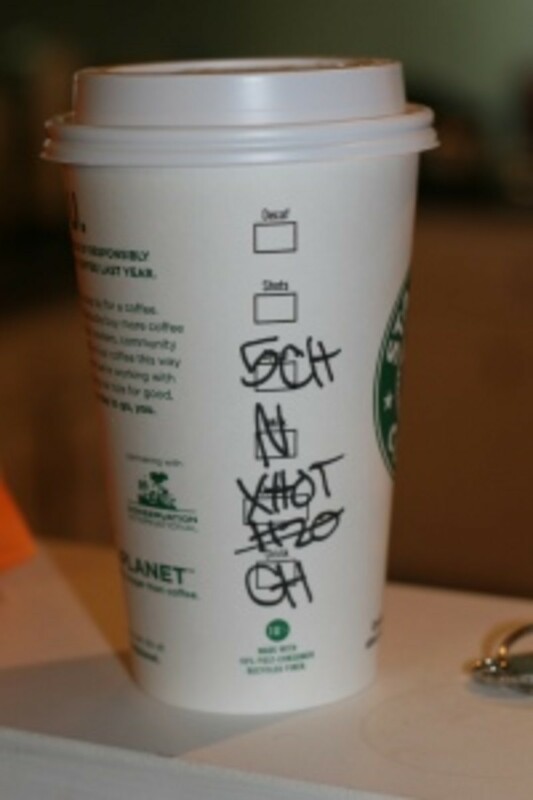 Your barista will know how to mark it in order for the drink to be made to your specifications. Just because you don't hear the words "an extra shot" doesn't mean that the barista hasn't relayed that you need a little more caffeine to get you through the day. A Starbucks barista pulls two shots of espresso. "So wait, I can get caramel and mocha in the SAME drink?" If you've ever asked your barista what kind of flavors you can get in your drink, your mind was probably spinning by the time they finished rattling off the long list of syrups, and you probably defaulted to the first syrup they mentioned. But with this information, you'll be able to see all the syrups and process them at your own pace, so that next time they ask, you'll already know what you'd like! The flavors offered at this time are: vanilla, caramel, cinnamon dolce, hazelnut, toffeenut, peppermint, raspberry, mocha, white mocha, and chai[a spicy tea concentrate, not usually combined with coffee]. Vanilla, caramel, cinnamon dolce, and hazelnut are also available in a sugar-free variety. 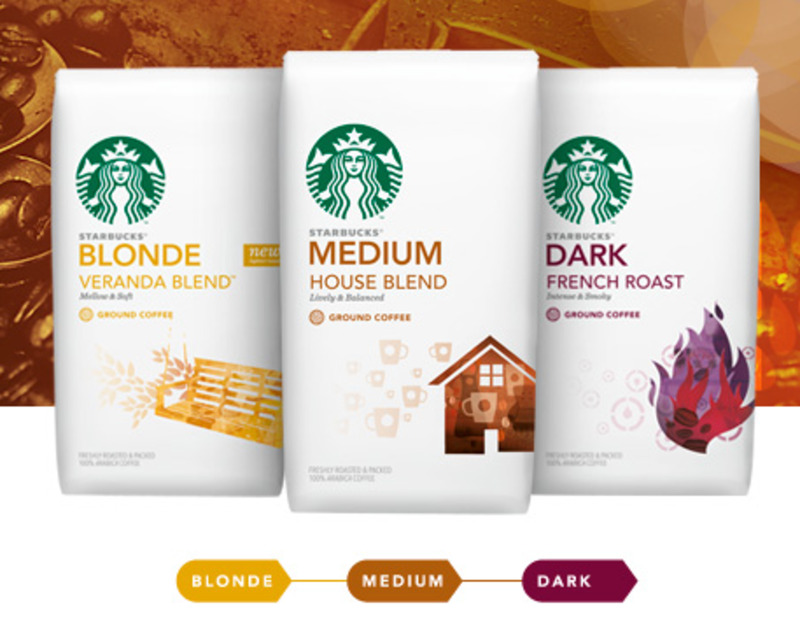 These flavors can be added to any beverage, such as: brewed coffee, lattes, cappuccinos, americanos, and frappuccinos[a subject I will tackle later in this hub!]. All of these flavors are fabulous alone, but are great when combined as well. Popular combinations include peppermint and mocha or white mocha, vanilla and caramel, or raspberry and mocha and white mocha. A lot of people request a "french vanilla," a flavor that theoretically is no different than regular vanilla. However, when asked, most baristas will suggest a hazelnut/vanilla mix, a combination that is similar to the flavor that is present in most french vanilla creamers and such. You can always have more or less pumps. One thing to keep in mind when combining flavors is that if you have multiple syrups, you will get the standard amount of each syrup. For example, if you order a tall caramel mocha, you will get three pumps of caramel and three pumps of mocha, for a total of six pumps of syrup. This may be great for some people, but for others it may be a tad on the sweet side, so feel free to adjust your pumps according to your preference. 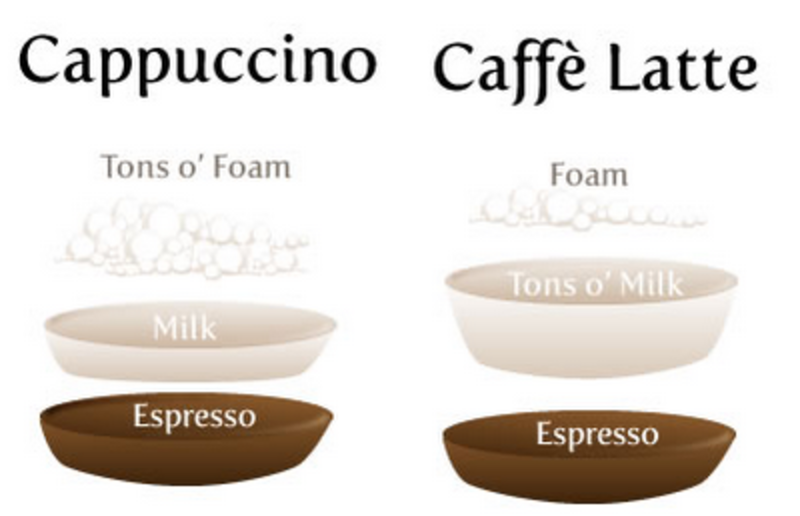 The difference in a cappuccino and a latte. "Why is my cappuccino so light?" Now that you're an expert when it comes to the size, the espresso, and the syrups, now you're ready to move onto what type of drink you'd like! I'm going to go over some common drinks. Everyone has seen the machines in gas stations that offer several varieties of "cappuccinos." 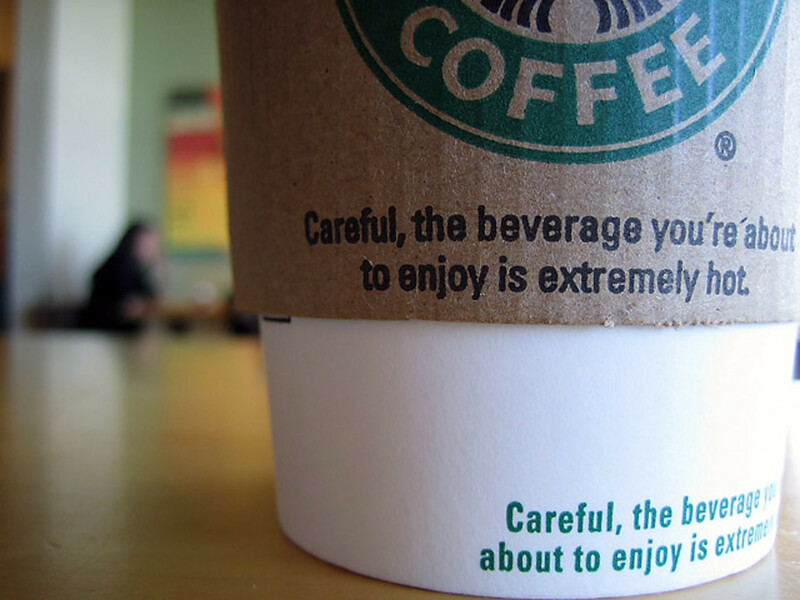 So, a lot of people come into Starbucks and order a cappuccino, thinking that's what they'll be getting. However, that's not the case. Here's a list of a few basic drinks, along with their definitions. Any of these drinks can be made hot or iced; the iced versions are made the same way, except with cold milk and served over ice. The flavors I talked about above can be added to any of the drinks to sweeten them up or add some fun to your drink! "This isn't my drink, mine was cold." Ever went into Starbucks on a hot summer day, ordered a frosty cold drink to cool off, and then were greatly disappointed when the barista handed you a piping hot drink? Your baristas aren't perfect, and it is a possibility that there was a mistake and you ordered correctly. However, they aren't mind-readers either, so unless you specify exactly what drink you want and how you want it, the barista will make it just as you ask for it. Most people are familiar with the Starbucks frappuccino product, a tasty blended beverage that is similar to a milkshake. But a lot of times when that's what you want, key words are left out and you end up with a drink that you're not satisfied with. So here are some tips to make sure that you get the perfect drink to help cool off on those sweltering hot days! There are two types of frappuccinos: coffee based and creme based. They're pretty self explanatory; coffee based frappuccinos contain coffee, creme based ones do not. 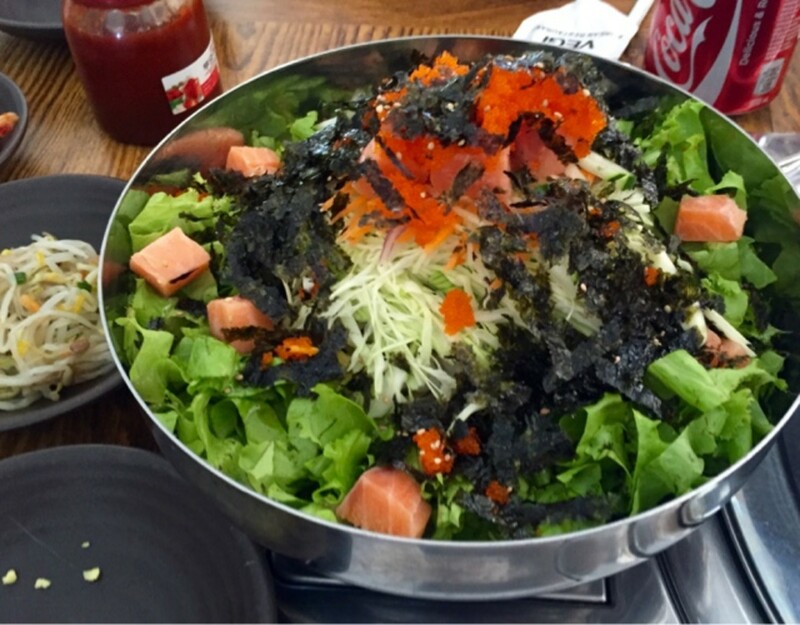 Most flavors can be interchanged between to the two types. But we'll just stick to the basics for now! When ordering these drinks, be sure to specify that you'd like the frappuccino. Otherwise, if you ask for a "Venti Mocha," you'll end up with the hot drink. Make sure to ask for a "Venti Mocha Frappuccino" to guarantee that you get exactly what you want. All coffee frappuccinos are available in a light version as well. When you ask for your frappuccino to be made light, it will be made with non-fat milk, no whipped cream, and also with a light base[a sort of glue that keeps the consistency smooth.] Light frappuccions have 1/3 the calories and fat of the regular version, while keeping the same great taste you know and love. 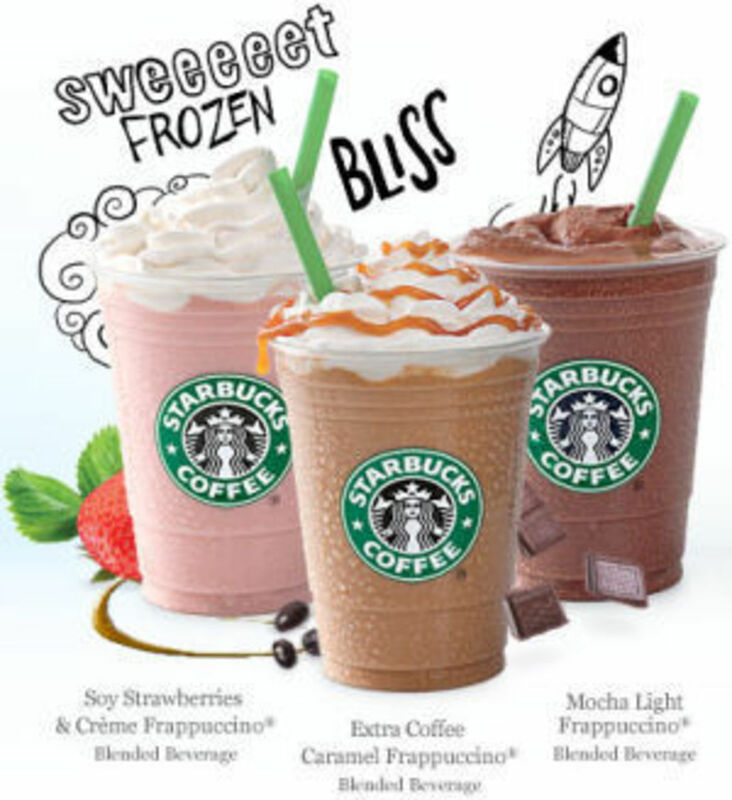 Frappuccinos are completely customizable, just like the hot drinks mentioned above. You can combine flavors, add extra coffee, get them with or without whipped cream. Don't be afraid to ask how you can customize your frappuccino! "Wait, that's all the drinks you have?" Like I said at the beginning, there are over 87,000 drink combinations available all at your local Starbucks. There is absolutely no way to cover all of them in one simple blog. There are hot and iced teas, over a dozen varieties of brewed and whole bean coffees, not to mention all of the pastries and sandwiches that are available. The easiest and best way to get exactly what you want is to ask questions. I cannot emphasize that enough. Your baristas are there to help you get the most out of your experience, not judge you on your lack of Starbucks lingo or coffee knowledge. Remember, at one point, the same barista who is answering all your questions and serving you your favorite drink walked into a Starbucks for the first time, and they had no idea what anything on the menu meant. So what are you waiting for? There's a Starbucks out there waiting to be "your Starbucks." 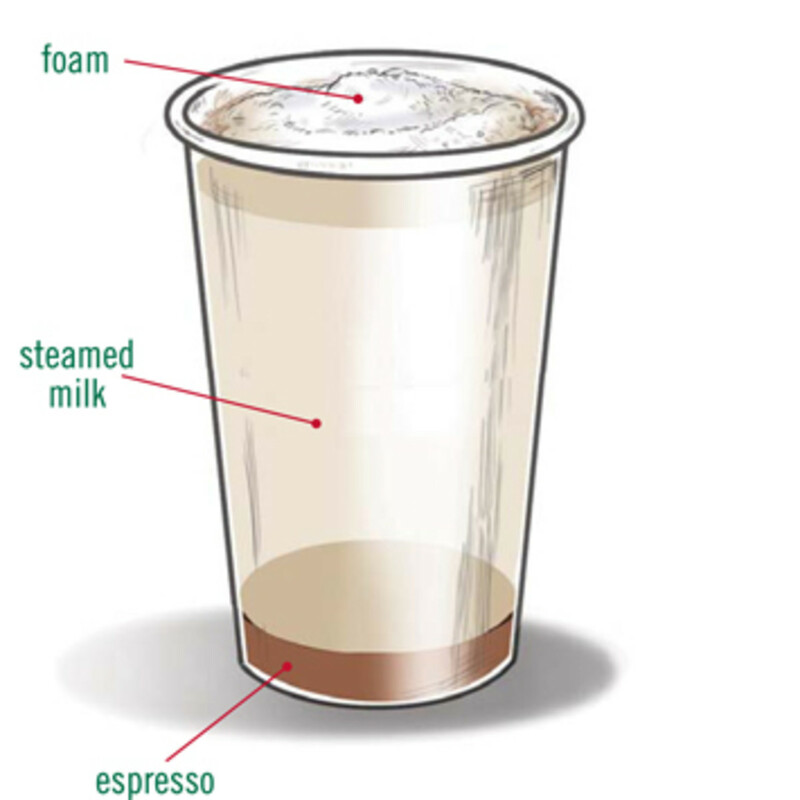 I'm a barista at Starbucks, and this guide is a great introduction to the menu. 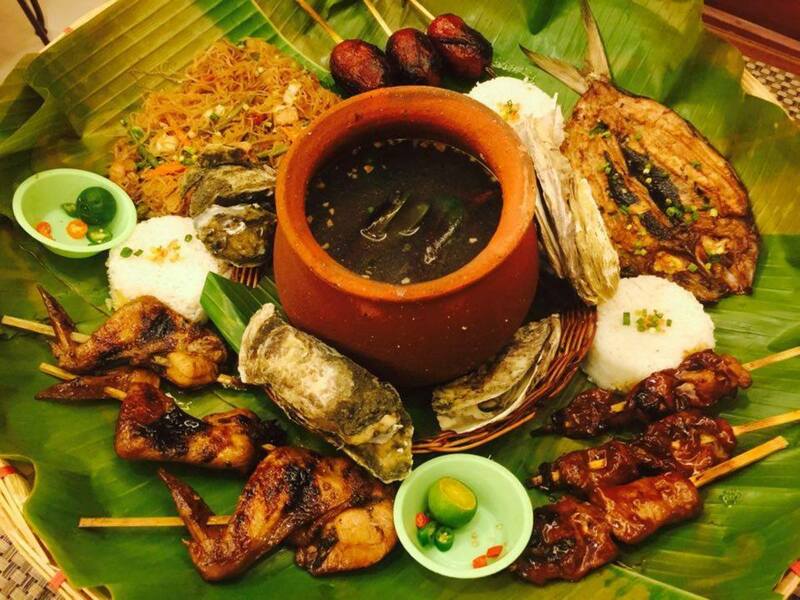 It takes a long time for us to learn all of the recipes and how to anticipate what a customer wants. I've been working for Starbucks for a little over three years, and I'm still learning new questions to ask customers every day. An experienced barista will be able to guide new customers through the ordering process, but the unfortunate reality is that there is a generally high turnover rate for this type of job. New baristas may not know which questions to ask to make sure customers are getting just what they want - that's why I love guides like this! @Richawriter, I would love to have a local coffee shop to go to! As you can imagine Southern West Virginia is a little lacking in the area of coffee and books. We do have a Starbucks, but it was built along the Interstate, just a couple years ago. Thanks for your comment, and the template is a new one on me! You're right, it has to be the category! Thanks again! I love coffeee and I'm lucky enough to have a wonderful coffee shop just down the road from me. It isn't starbucks but it is cheaper and the lady lets me have any combo of flavours I wish. At the moment my favorite combo is Mocha Almond!!! Yummmyyyyy although the daily intake of it is quite clearly adding a little to my love handles! Great hub! Take care. Oh by the way, this hub template is different. How come it is like this? The category? LOVE IT! I live on Starbucks ... If ever in Dallas the best Starbucks is on Lemmon Ave. 75219 zip..
Venti Caramel Machiatto!!!!! ahhhhh the cravings! This is great hub - very informative. LOL, I linked you on my Facebook page and half my friends said "Thanks, Mo, now I need Starbucks." Oy, Starbucks gives me a headache. Dunkin' Donuts! this is brilliant, fantastic outlook and information, definitely need a good cuppa in the morning, thanks for sharing this, voted it up etc. I really like this and it will make it easier to order next time I go. I always feel like one of those people who takes forever to order. I'm definitely one of those who gets their day started with a cup of coffee. I certainly don't drink at Starbucks every day, but I'm no stranger there either! With that said, I didn't realize they offered over 87,000 drink combinations! Very nice Hub with lots of great information!